GRP composite doors from Permadoor are finely crafted to replicate the appearance of timber doorsets but offer low maintenance. Thermoplastic faced composite door technology has been the tried and tested solution for social housing for over two decades. Communal doors are usually the most heavily used doors in a public building, so it is important that the quality is right. We provide access solutions incorporating a range of DDA compliant disabled access doors. Permadoor provides stock doors as a solution to the need for remedial replacement doors on a very short lead time. Low maintenance outhouse doors are available in Thermoplastic or GRP finishes. Doors are supplied with a weather seal for enhanced weather performance and a drip head for outward opening doors. Permadoor is the original manufacturer of specialist composite doors in the UK. We have over 25 years’ experience in the affordable homes, new build and social housing markets and are the UK’s number one supplier to the social housing sector. Our extensive experience includes working with local authorities, housing association registered providers and contractors on refurbishment and new build projects across the UK. 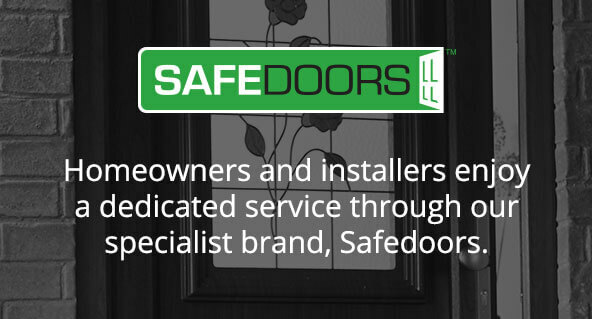 At Permadoor, providing quality products and service is key and we hold the most comprehensive range of accreditations. We are a Secured by Design licence holder and all our doorsets are fully compliant with the latest building regulations and standards. FIRST to use recycled composite material as a frame reinforcement. NEW BIM files ready to use and download, click here.